I had lot of left over sambar. I didn't want to carry to next day also. So wondering what do with that. I have to do something for dinner. I am not having Idli or Dosa batter so what can be done with Sambar. Bingo! 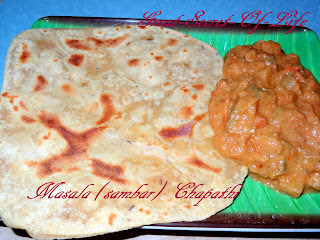 Masala Chapathi. I did that quite sometime ago and no can figure it out... And tasted good. It was also pretty soft. Interesting way to use sambar!